2 – TAKE out the CD-ROM from the camera package of your Lilin camera package and install the IP Finder Program. 3 – Set the IP address of the camera so that they are in the same LAN as the computer. 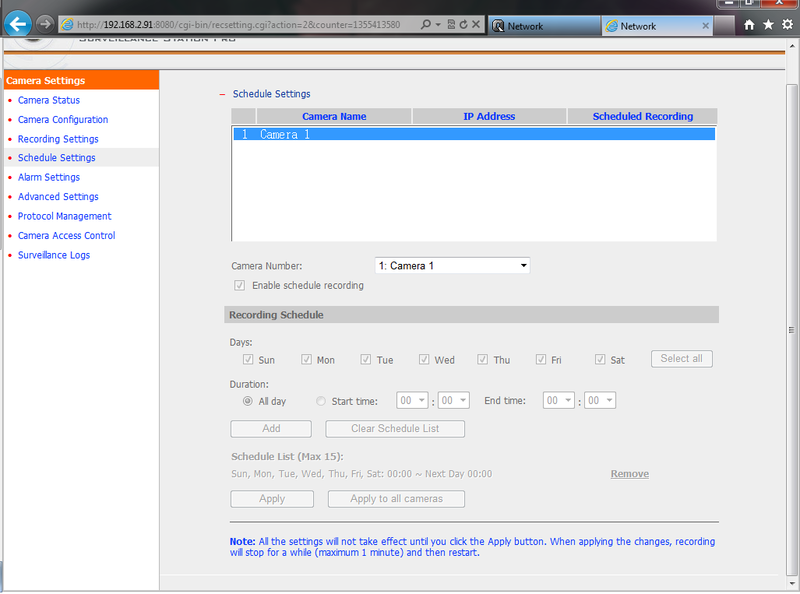 You will then be able to login the configuration page of the camera with the IE browser. Enter the IP address of the camera as 192.168.2.95. 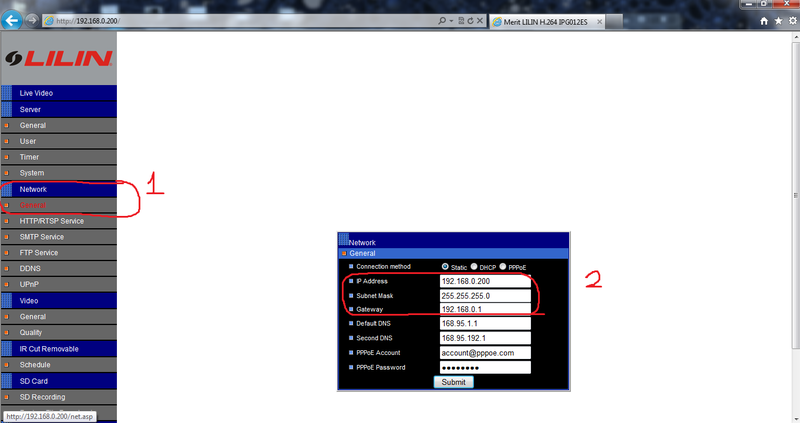 The default gateway should be set as the LAN IP of the router (192.168.2.1 in our example). 4 – ENTER the web configuration page of the IP camera. 5 – The first time you access the configuration page by the IE browser, remember to install the ActiveX control if asked. 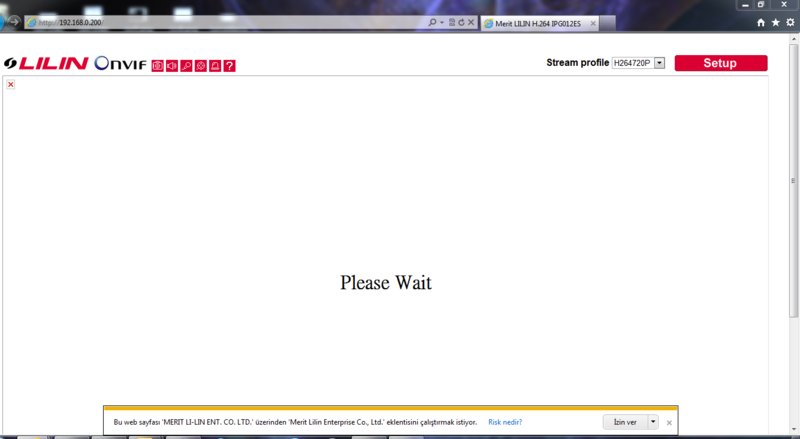 You will then be able to view the monitoring image. 6 – GO to ‘Network -> General” and check the IP settings of the camera. Tip: What if I forget the camera settings? Press the reset button at the back of the camera for 5 to 10 seconds. The camera settings will be restored to default. You can then set the IP address and login the camera’s configuration page by the default login name and password (root / pass). 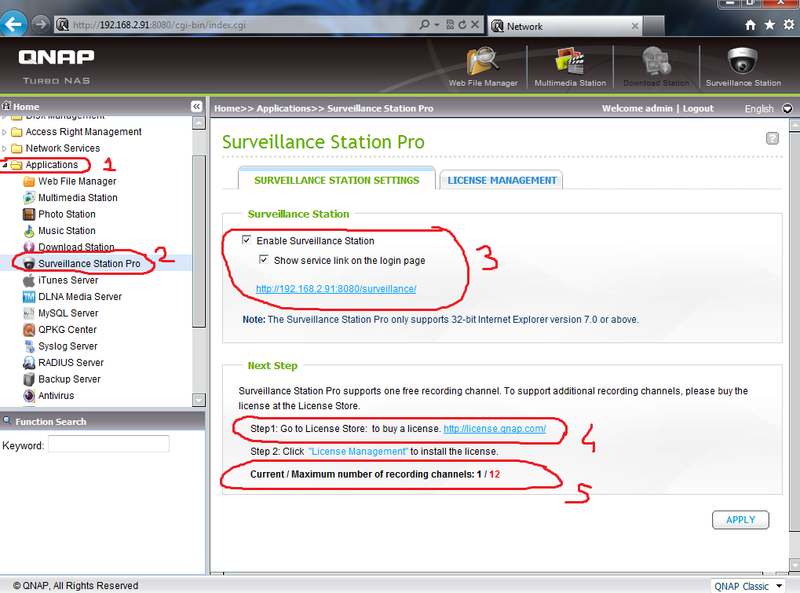 Note: The Surveillance Station Pro is only supported on Internet Explorer 6.0 or above. 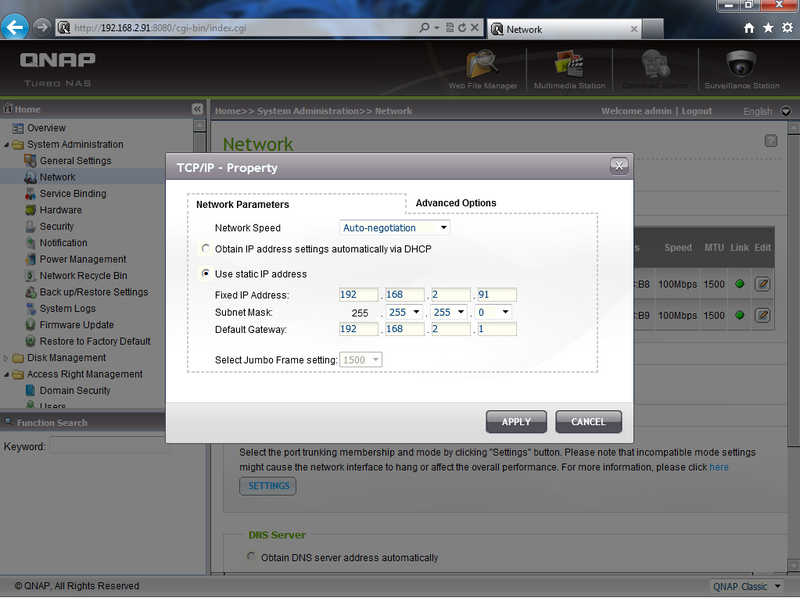 1 – Go to ‘System Administration‘ > ‘Network‘ > ‘TCP/IP‘ specify a fixed IP to the NAS: 192.168.2.91. 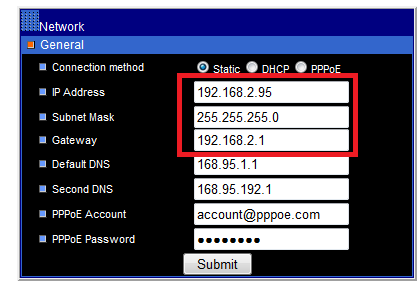 The default gateway should be the same as the LAN IP of your router, which is 192.168.2.1 in our example. Also you can see how many IP cameras your NAS Support at next step. Ex: Ts-469 Pro Supports 12 IP cameras. 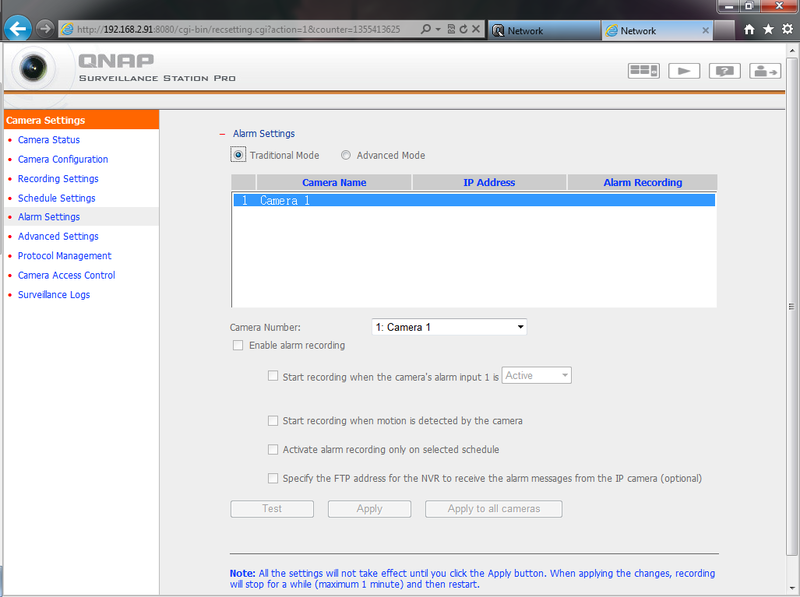 4 – Ps : After updatting 3.8.0 Firmware to 3.8.1, My Ts-469 Pro supports 16 Ip cameras! 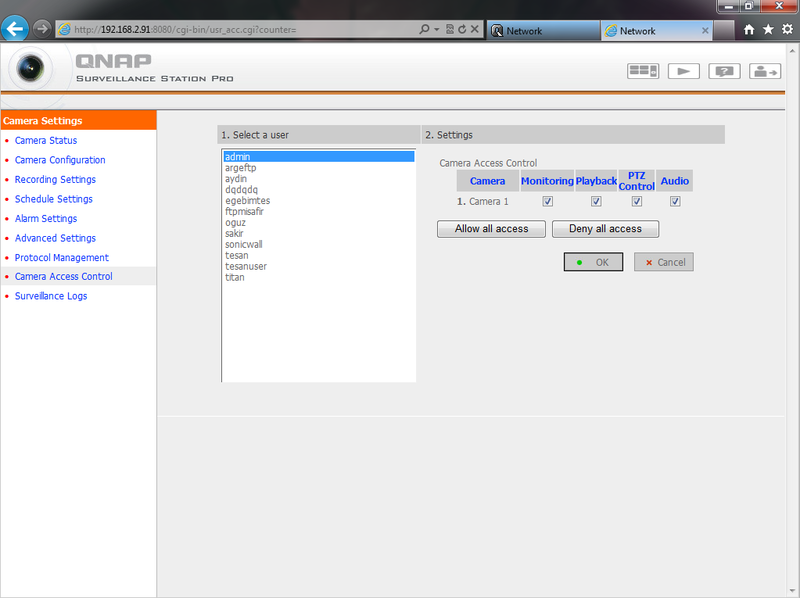 So Dont forget to update your Qnap to Latest Firmware. Select your Camera, Camera Brand / Model (At this case I Use Lilin camera on Onvif). 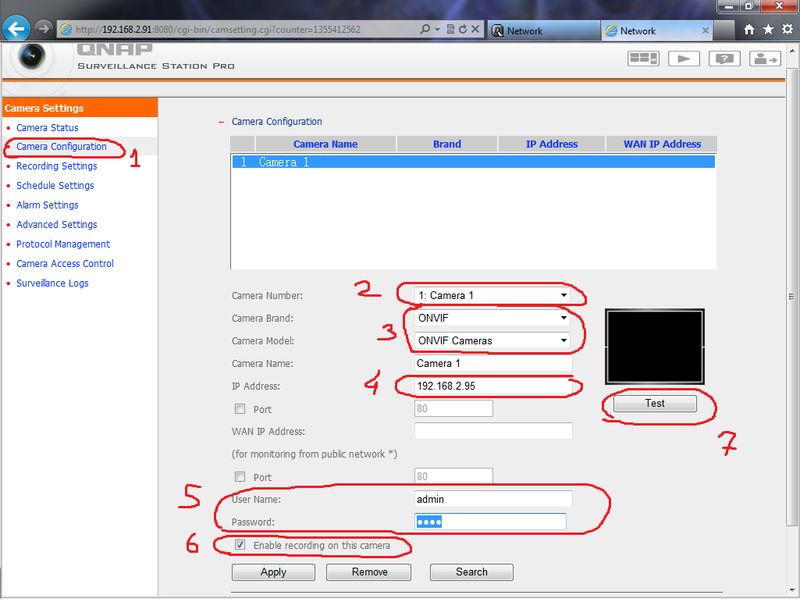 Enter your IP Camera Lan IP adress (Or WAN if you have), IP Camera Username & Password and press “Test” Button. If you do right configration, Camera Recording Image Should be appear like this, and press Apply button. 8 – If you want to change IP camera Recording Quality or enable the audio recording option of the camera, go to ‘Settings‘ > ‘Recording Settings‘ page. Click ‘Apply‘ to save the changes. 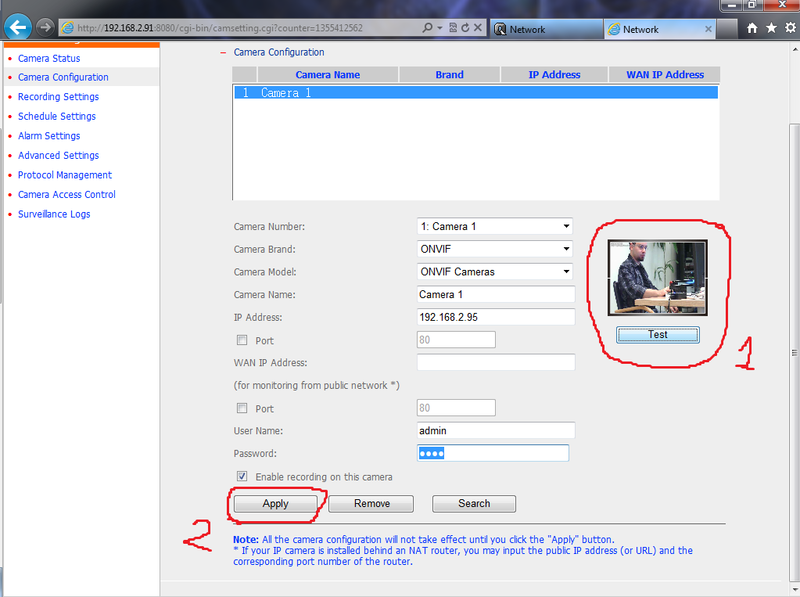 Note : If you use “Onvif”, your camera may not be support to change these options, so please change this configration from IP camera Settings options on your IP camera. 9 – Now press Live View Button. 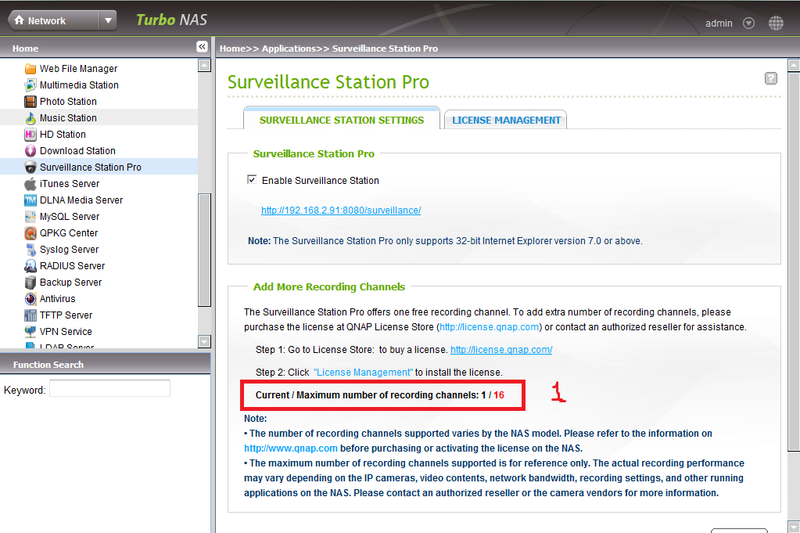 10 – After you have added the network cameras to NAS, go to the ‘Live View’ page. The first time you access this page by IE browser, you have to install the ActiveX control in order to view the images of Camera 1 and Camera 2. 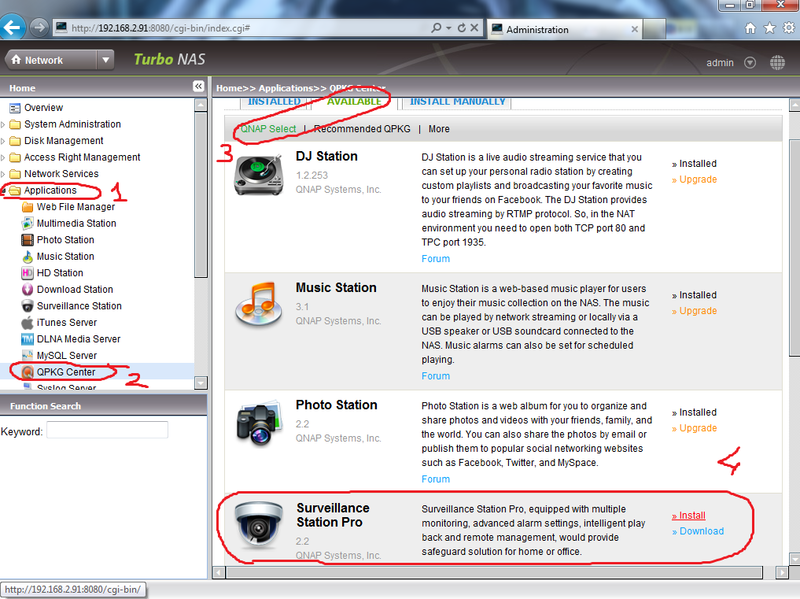 You can start to use the monitoring and recording functions of the Surveillance Station! 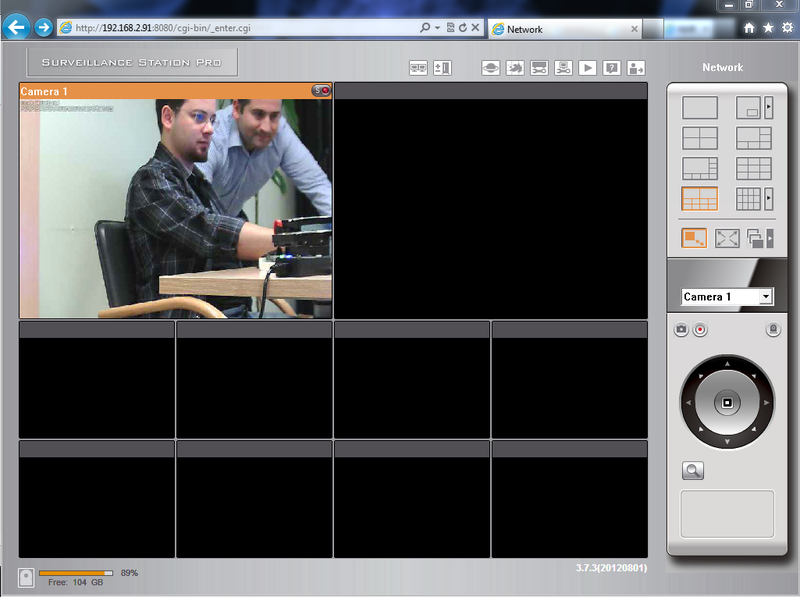 Tip: When you click on the monitoring screen of a camera, the frame will become orange. You can use the buttons on the right panel to control the camera. 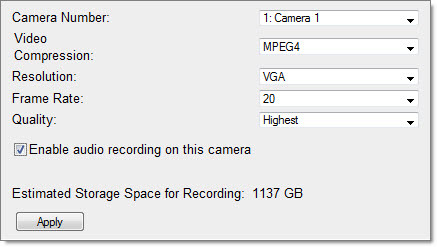 For example, you can take a snapshot of the monitoring image, enable or disable manual recording, enable or disable audio function of the camera, use audio broadcast function, or enter the camera’s configuration page. If you have any Questions, Please contact with Qnap Taiwan Support. Just go users -> user groups and Add this user to “Administrators” Group. 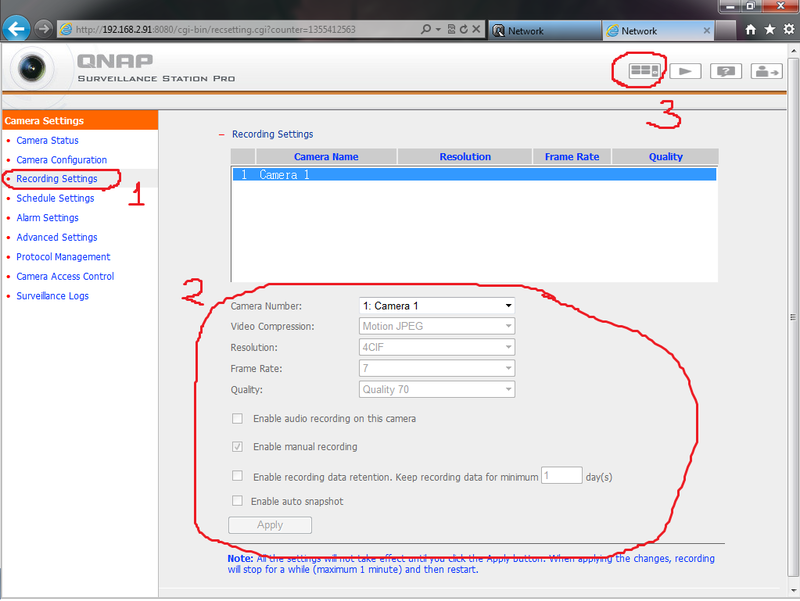 1 – Check if Qnap and NVR is in the same IP subnet. 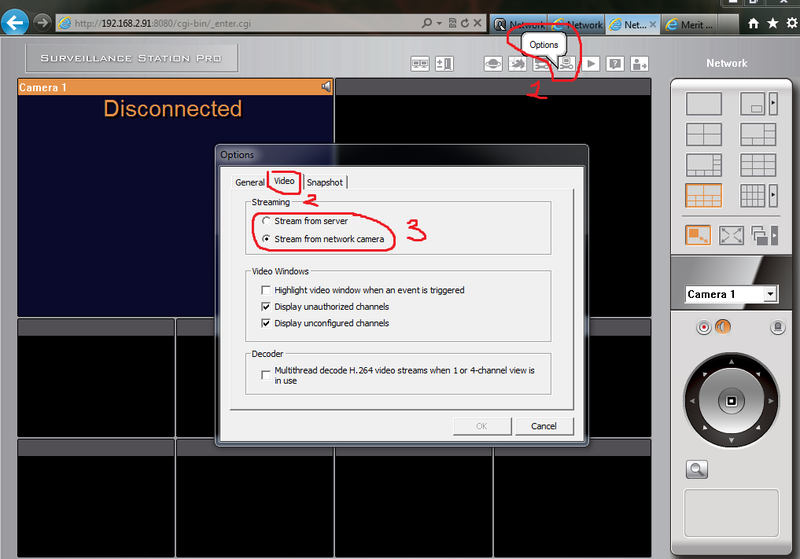 2 – Also Check if you have Gbit Conenction. 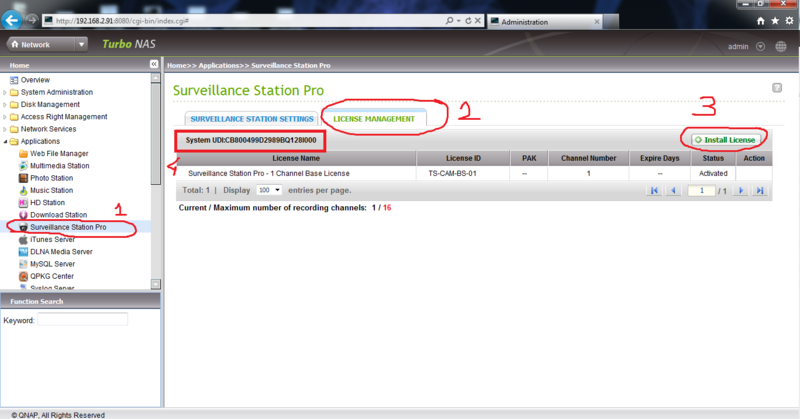 Go Application s -> Surveillance Station Pro -> License Managment and press “Install License”. Also you can see Qnap System UDI number under this page. 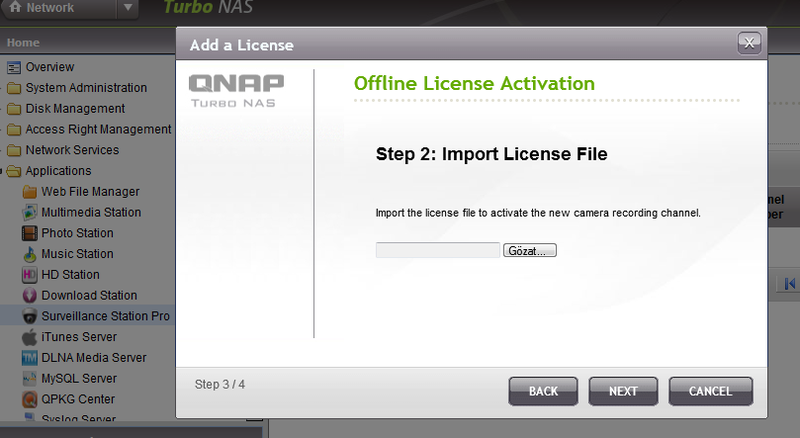 If you already contact and get Activation license, press “Offline Activation” and press next. Chooe your license and finish. Enter the Product Authorization Key (PAK) code to activate. Below is a quick how-to for implementing public / private key authentication for SSH. This is by no means an exhaustive examination of the subject. *nix distributions vary slightly and further research may be needed. Public key authentication is considered a more secure methods of authenticating the Secure Shell than the simple password challenge routine, a method often broken by brute-force attacks. In addition, public key authentication allows for automated login routines between machines, thus enabling a range of scripted jobs (think rsync or port tunneling). It can also simplify the login process without compromising password security. Public key authentication uses a pair of computer generated keys – one public and one private – to authenticate between a host and a client. The public key is derived from the private key. When authenticating, the host machine compares the public key to the private key in order to verify the veracity of the public key. If the two match, access is granted. Security of the system is predicated on the security of the private key. Generate the needed Public and Private keys on the host. Transfer / append the public key to the authorized_keys file on the client. Login via Public Key Authentication. The below setup description assumes that you are able to run terminal or a terminal application like Putty, and that you are familiar with basic commands. It doesn’t take much. Let’s setup SSH public key authentication between your home computer (hereafter referred to as the “Host”) and your QNAP device (hereafter referred to as the “Client“). #    ssh-keygen -t rsa -C "server comment field"
Note: the -C switch is not required. It allows you to insert a comment that will appear in the authorized_keys file. It is helpful for identifying and managing keys within the authorized_keys file on the Client in the event that you have multiple key logins. Replace “server comment field” with a machine name, IP address, date, or task name so that you can easily identify where and why a given key was created. #   Generating public/private rsa key pair. Note: “UserName” is the user account that you have logged into via SSH. Also note that the actual suggested path may vary slightly depending your system. You should accept the suggested location unless you have reason to do otherwise. You will then be prompted for a passphrase that will be associated with this key. The keys have now been generated and are stored in the .ssh folder associated with the user account on the Host machine. 3. The final steps are to copy the public key to the Client and append it to the authorization_keys file. There are a number of ways to do this – you can copy the file to the Client and then append it (I like this method being the relative noob that I am. It involves more steps but is the easiest to complete without error. Those proficient with terminal commands will do it all in one step from the Host). Alternatively, you can open the id_rsa.pub file via a text editor like iv and copy the key text – then open the authorized_keys file on the Client and paste the text directly into the file. I will walk you through the noob method. admin@ClientIPAddress is the address of your QNAP NAS (the Client) followed by the path on the Client where the public key needs to reside. You will be ask you for the password of the “admin” account to login to the Client. Enter the password to complete secure copy. 4. On the Client (QNAP NAS) navigate to the /etc/config/ssh folder and “ls” to reveal the contents of the directory. You should see your id_rsa.pub file. 5. Now let’s append this file to the authorized_keys file which needs to reside in this directory. Do not worry if authorized_keys file is not present. We will create it. Note: You have to cut the key in the file to one line, and add ssh-rsa in at the very beginning. That’s it. You should now be able to login using key authentication. Logout of the Client and attempt to login. If you created a passphrase for your id_rsa private key then you will be prompted for the passphrase. If you left the passphrase field blank when generating the keys then you will be logged in automatically. The first time you login you may encounter a promoted message like below. Are you sure you want to continue connecting (yes/no) ? Type “yes” to continue. After you accept the authenticity of the RSA key, the Client information is saved in the /Users/UserName/.ssh/known_hosts file. You will not be prompted again unless you remove this file. The procedure is the same when setting up key authentication between two NAS boxes. Simply follow the steps above substituting a NAS device for the Host and Client as per the above example. You must keep your private key secure! Security of public key authentication is dependent on your ability to secure the private key. You should avoid generating a key without a passphrase. If you have an unencrypted private key (no passphrase) stored on your workstation and if your workstation is compromised, your Client machines have been compromised too! If a hacker can obtain the private key they will have access to any client machines accessible with the public key. Further, in the event that your machine is compromised you should consider strongly the possibility that your keystrokes are being logged and therefore any private keys that ar protected by passphrases have likely been compromised. In addition, you should never allow root-to-root trust between systems. Unfortunately, the firmware version of the QNAP NAS series is hardwired with a variant of OpenSSH that only permits ssh login by the root (admin) user. You are strongly encourage to update the SSH Daemon With OpenSSH as per http://wiki.qnap.com/wiki/How_To_Replace_SSH_Daemon_With_OpenSSH. You can then setup named accounts for users or roles, granting as little root access as possible via sudo. You should also limit the “from” access of the public keys, and if possible only allow specific public keys to run specific commands. 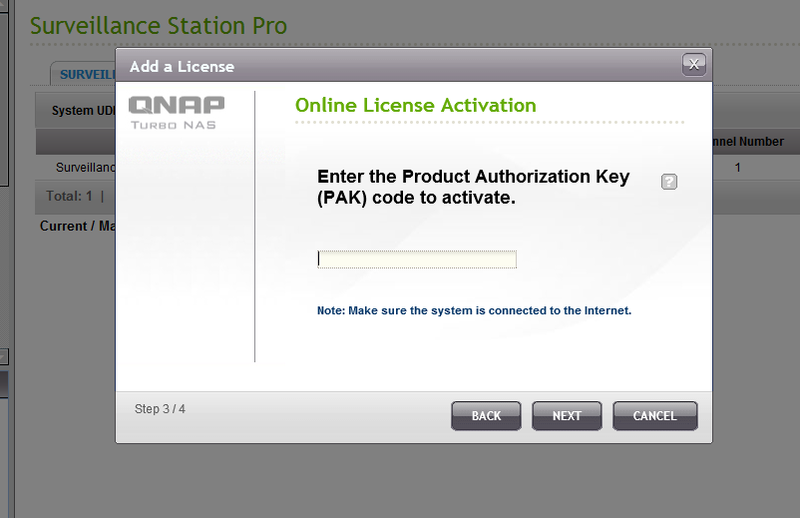 Here is an example which tells you how to set up authorized_keys between two QNAP NAS units. For example, we have one TS-209 (10.8.12.209) & a TS-509 (10.8.12.33), and now I want to make it possible to SSH login to TS-509 from TS-209 without password. 2. Execute the following command, secure copy the id_rsa.pub from TS-209 to TS-509, and save it as “authorized_keys”. 3. You might see a promoted message like below if this is the first time you are trying to access one NAS from another. Simply type “yes” and go to the next step. The authenticity of host '10.8.12.33'(10.8.12.33) can't be established. 4. And it will ask you for the password of the “admin” account to login the destination host (10.8.12.33), just enter it and finish the secure copy command. It would be nice if the Surveillance Station started to support H.265! Is there any sort of timeline for that feature?